Sometimes you’re working on something and you make a discovery but you don’t know exactly what the discovery is. In other words, the outcome is pleasing but you don’t know how you got there, or what the elements of your successful execution were. Or why, exactly, this works when something very similar doesn’t. This painting is one such example of this experience. I am holding on to it because I think it has something to teach me. I will hold onto it until I think I’ve gotten the message. With still life paintings, I think a lot about the relationship of the rectangles – background, foreground, middle ground – and the values – the relationship of light and dark. And color – pure shots of gorgeous color, chroma vs. neutral, shades of gray. But today the aspect I keep thinking of temperature. The painting shifted for me when I repainted the background in a warmer neutral than I’d had before. That change, moving from a cooler gray to this warmer “pancake” neutral, was a “bingo!” moment. It caused me to reexamine all of the other paintings in this series. It caused me to reflect on the concept of painting relationships between things vs. the things themselves. 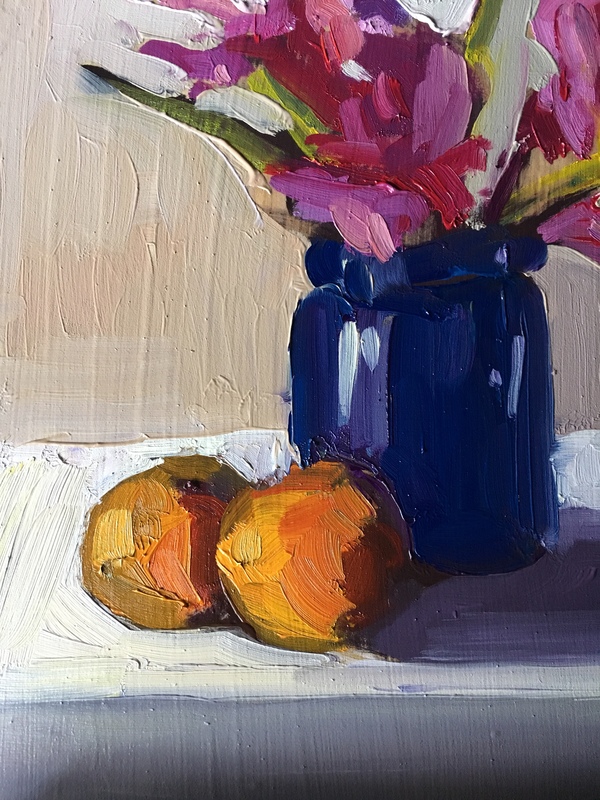 Broken Gladiolus, Cobalt Blue Jar, Tangerines is one in a series of “teachers” I’ll be showing at my Holiday Open House Friday and Saturday November 23 and 24. Sketches, paintings, photographs, books prints and cards will be for sale, but the “teachers” will be on display in my special cabinet where I keep them to look at from time to time and to reflect on their lessons. Interested in what they might have to teach you? Come by! We can have a conversation! Does this concept resonate with you? If you are a “maker” are there things you make that you consider your teachers as well? Please share and comment below! By now, I thought I would understand how to create a painting that I find satisfying…a balance of all the elements and energy, technique, etc. I find instead, that each painting is a mystery. The ones that I learn the most from are the ones that I try to fix, adding this and that, only to discover that the painting died somewhere in the process. So I keep painting, looking, learning along the way. Your open house sounds delightful, your paintings very beautiful. Thank You! Absolutely! I have a few I’ve kept and especially when I’m ‘stuck’ I take a look and try to figure out the elements that I need again…. Yes there are those teachers that I simply must hold on to as well. My first landscape, my first time using a certain style of brush stroke or type of color and then I see something. I also have some that I think are basically…teachers and oh boy are they awful looking. I have kept these and now will gesso over them. I am ready to move on and let go of the works I have done. This is a hard thing at first…letting the painting go. My paintings are a record of what I am going through and what I am opening up. This has been a very spiritual practice for me. I paint my emotions and my visions. Sometimes I have no idea where they come from…these paintings. So much fun! A “lesson earned, learned and celebrated…is what my NFS represent. How did I get there?..and it works! I agree with you. I display these pieces where I can view them to encourage me to work on! Thank you Erin for your guidance. So love your observations on your process. I’m a painter and fiber artist and wish I still had some of my “teacher paintings.” They are like a curio cabinet combined with our love for what we do and a passion for learning that fuels these tiny discovery celebrations for me! Almost so they’re so personal that I think they’d bore most people stiff. Love your work Erin. So fresh! Thank you so much MaryRose!! You’re so kind!